What I have described does not only apply to driving a car. It can happen with each complex skill or set of skills, whether it is playing a musical instrument or practicing a profession. That you have performed the skill for over hundreds or even thousands of hours, does not guarantee that you have become better at it. Indeed, professionals with many years of experience can each perform less well than professionals with only a few years of experience. An explanation for this is that we often stop deliberate learning when we have reached a level of acceptable performance. From that moment on, we more or less go into automatic pilot mode. This is the reason why our performance often plateaus after the first few years of professional experience. But it is actually possible to keep improving. This requires that we believe that getting better is possible (read more about mindset) and that we keep focusing consciously on learning. Eduardo Briceño distinguishes the performance zone and the learning zone. In the performance zone we focus our attention on executing a task the best we can. We are applying the knowledge and skills we already have. In the learning zone we are focused on improving our knowledge and skills by doing activities which are specifically designed for learning. In the performance zone we try to avoid mistakes as much as possible and do the best we can. In the learning zone we are open to making mistakes. This is important because learning works best when we focus on things in our performance that need improvement, in other words, the parts of our performance that we have not mastered very well (read more about deliberate practice). When we do this, when we go to the boundary of our skills, it is inevitable that we will make mistakes. Thus, in the learning zone, there needs no be safety. Making mistakes must not lead to harsh judgments or punishments. It must also not be the case that mistakes may lead to serious damage, for example for customers of patients. The learning zone must be a low stake situation. In the learning zone we can, of course, also do other things than practicing, such as studying. Working effectively does not only depend on having the right skills but also on having relevant knowledge. Knowledge, I think, is often an underestimated factor in effective performance. And because knowledge is usually developing quickly it is necessary to keep investing in your knowledge development. To do this effectively, you must know about how to study effectively (read more). 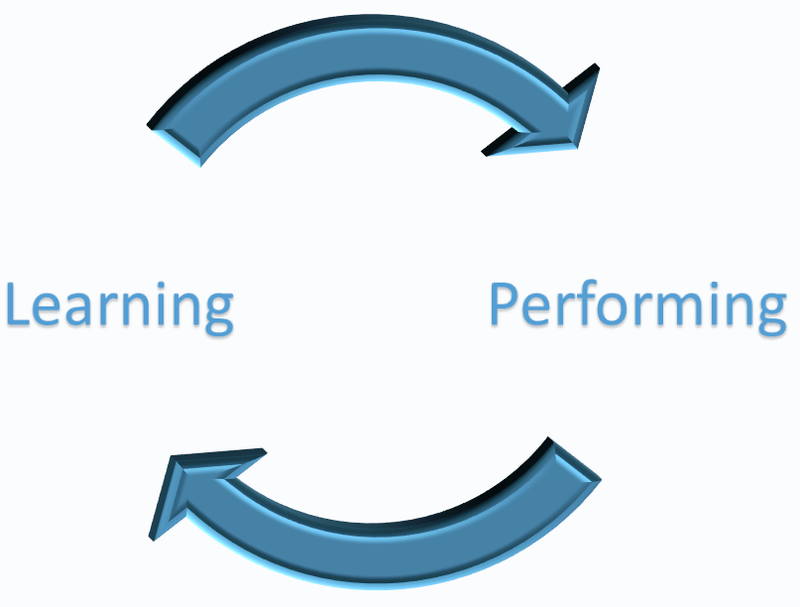 The learning zone can take place at a relative distance from the performance zone. For example, a manager may participate in a training program focused on autonomy supportive managing. 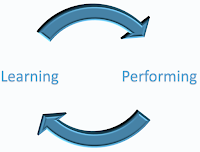 But the learning zone can also take place very close to the performance zone. When we have to perform a difficult task we can think in terms of three stages: the preparation stage, the performance stage, and the reflection stage. During the performance stage we are, obviously, in the performance zone and we focus on doing the best we can, trying to avoid any mistakes. During the preparation stage and the reflection stage, we can deliberately enter the learning stage. During preparation we can, for example, deliberately practice difficult aspects of what we will have do during the performance stage. During the reflection stage we can also get into the learning zone by thinking carefully about what went right and what could have gone better during the performance stage, and perhaps get some feedback by others. Based on this, we can determine what our further learning activities should be focused on. Supporting continuous learning, and differentiating between learning and performing, is both in the interest of individuals and organizations. Individual who keep working effectively at their own professional development may thereby prevent that their skills and knowledge development will stagnate and thus become less and less scarce. By keep a focus on learning we may keep up with the times and stay valuable on the labor market. At the same time it is gratifying to keep learning. People are intrinsically motivate to keep developing their competence. You might say: it is unnatural and frustrating to not have the opportunity to keep learning. For organizations it is also beneficial to support employees' continued learning. First, it helps to slowly but surely end up with a workforce with obsolete knowledge and skills. Second, it helps to prevent frustration of the natural need for people to keep learning. Organizations which keep investing in the continued development of their employees build, by doing this, a healthier psychological contract with their employees than organizations which continuously force them to be in the performance zone only. Permanently trying to keep employees in the performance zone is a short term strategy which is not very sustainable. I have summarized the above into 7 questions which you can use as a checklist to use for yourself or discuss in your organization. Are you aware of the fact that experience alone does not make you better? Do you believe that it is possible to get better at the things you want to get better at? Are you aware of why it is necessary to distinguish the performance zone from the learning zone? Do you know how to enter the learning zone during the preparation stage and the reflection stage? Do you know how to use deliberate practice to improve your skills? Do you know how to use effective study skills to improve your knowledge? Does your organization see the importance of continued learning and do you get the opportunity to spend sufficient time in the learning zone? This is excellent information that is relevant to my presentations for ESL/EFL teachers related to professional development.